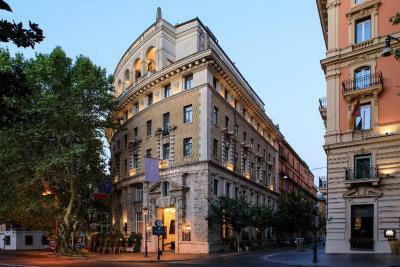 Lock in a great price for Grand Hotel Palace Rome – rated 8.3 by recent guests! Safe and comfortable Welcoming nice staff The location is the best feature followed by modern furnishing 2 TV channels broadcast In English top crime is the best channel The Hotel restaurant provides superior and tasty food with superior service. Great location. Able to walk to all attractions. Many restaurants nearby. Great staff and very clean. Great room . Beautiful bathroom. Large and comfortable bed. Love the big window. We had a great stay at the hotel, the stuff were very helpful and replaced our initial room we received for a different one with no problem. 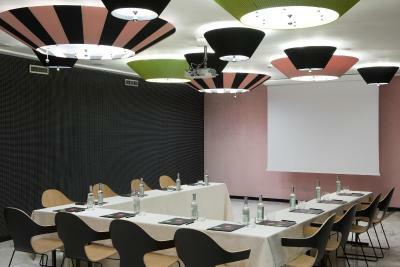 The location was great and the stuff were very helpful - they assisted us with booking tickets to the Vatican as well. 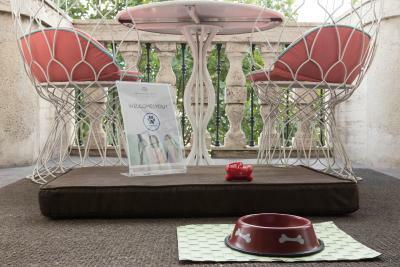 We loved everything about the hotel but there was no comfortable chair in r room. The chair looked good but was not comfortable. The staff was exceptional efficient and always happy to assist. Housekeeping always checking in r needs for towels and service. Giada and Poalo a special thank you. the staff at reception and porters were all great. 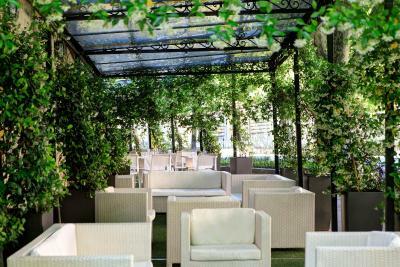 It is a boutique hotel that is extremely quite and the location is unbeatable to access everything that Rome has to offer. I stayed here before, many years ago, but the renovations were amazing and enjoyed it immensely. 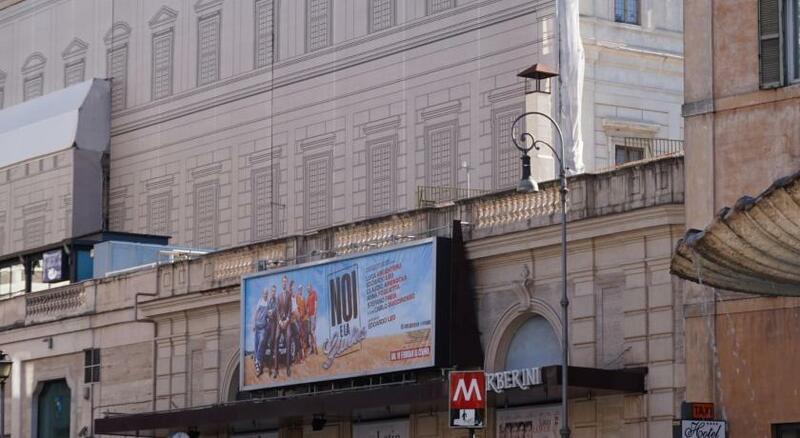 The best street in Roma! I would suggest this to anyone who prefers boutique hotels 5 stars and safe surroundings. Very centric location, we were able to walk to the different places that we wanted to go. The rooms were comfortable and the staff was very nice and helpful. 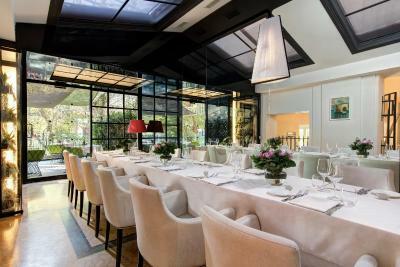 Grand Hotel Palace Rome This rating is a reflection of how the property compares to the industry standard when it comes to price, facilities and services available. It's based on a self-evaluation by the property. Use this rating to help choose your stay! Located on Rome's Via Veneto opposite the American Embassy, this luxury hotel dates back to the 1920s. With free WiFi throughout, this property offers rooms with designer furnishings, an à la carte restaurant, and a free spa. 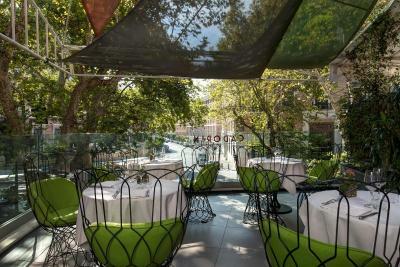 Villa Borghese is 1,300 feet away. All air conditioned, rooms at the Grand Hotel Palace include an LCD satellite TV and a mini-bar. The marble bathroom includes VIP toiletries. 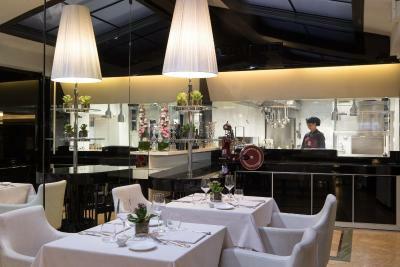 Guests can enjoy fine Italian cuisine at the Cadorin Restaurant. Breakfast is an extensive American buffet with sweet and savory options. 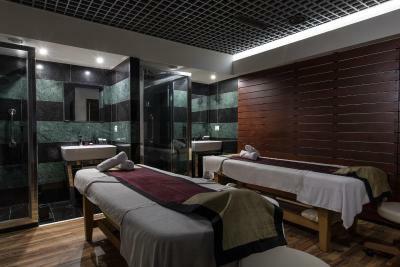 After a day out, guests can unwind at the wellness center which includes a sauna and a hot tub. 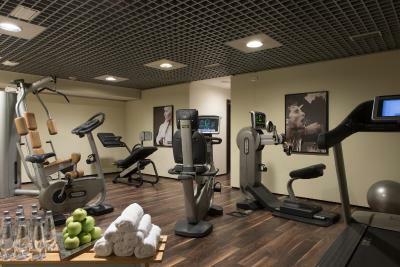 Massages can be reserved, and a fitness center is also available. 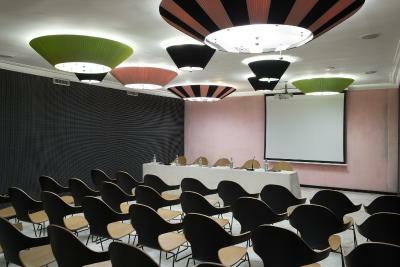 The building, designed by Marcello Piacentini, was stylishly restored by Italo Rota. 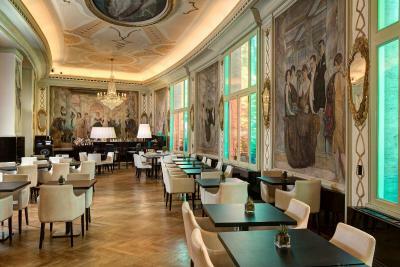 The Cadorin grand hall, and the ultra-modern business lounge with bar, are ideal for relaxation. 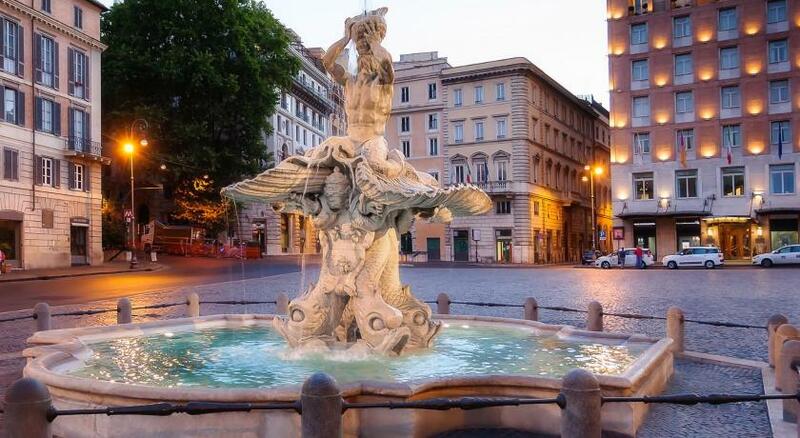 The hotel is 5 minutes' walk from Piazza Barberini and Barberini Metro Station, on line A. The Spanish Steps are a 10-minute walk away. 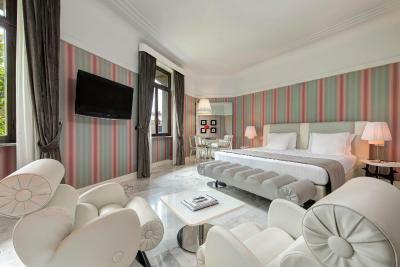 When would you like to stay at Grand Hotel Palace Rome? Offering air conditioning, free WiFi and an LCD TV, this elegant room comes with luxurious furnishings, a mini-bar and a safe. Private parking is available at a location nearby (reservation is needed) and costs EUR 40 per day. Offering free WiFi and air conditioning, this elegant room comes with an LCD TV, a safe and a mini-bar. The private bathroom includes a hairdryer, bathrobes and free toiletries. Offering a terrace, free WiFi and a flat-screen TV, this elegant air-conditioned room comes with luxurious furnishings, a mini-bar and a safe. Featuring free WiFi and a seating area, this large air-conditioned room includes a coffee machine, an LCD TV, and a mini-bar. Featuring a living room and a coffee machine, this spacious suite includes free WiFi, a mini-bar, satellite LCD TV and air conditioning. 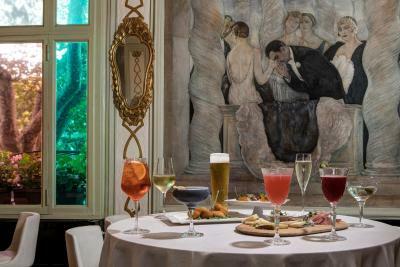 Grand Hotel Palace was built in 1925 by Gino Clerici and decorated by the illustrious architect Marcello Piacentini in the 1920s according to the Roman architecture of the Renaissance. At that time it was recognized as the "Palace of the Ambassadors" because it was built to accommodate diplomats of the nearby Embassies. 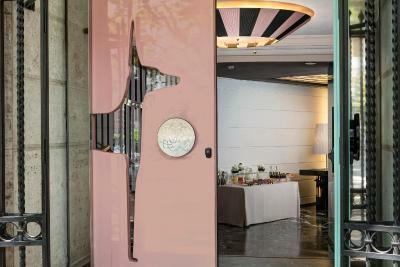 The design of the building is reminiscent of the Bohemian street cafes and it is a suggestive example of that Roman modernism with a touch of French Art Nouveau. 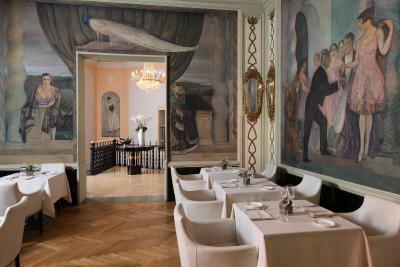 The exclusive restaurant of the hotel, the Cadorin Salon created in 1926 by the Venetian artist Guido Cadorin, is another artistic relic decorated with extraordinary frescoes. The five large frescoed panels, which are an artistic heritage protected by Fine Arts, depict Roman high society in the nineteen-twenties. 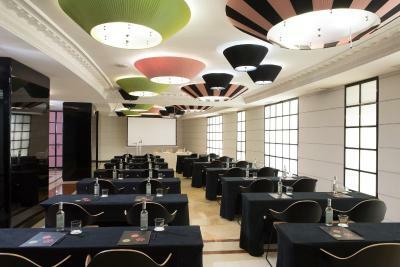 In October 2010 the Grand Hotel Palace has reopened to the public after major renovation work giving it a wholly new light where the present and the artistic past merge in a perfectly-balanced stylistic continuum. 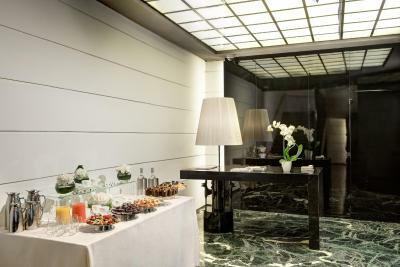 House Rules Grand Hotel Palace Rome takes special requests – add in the next step! One older child or adult is charged EUR 99 per person per night in an extra bed. 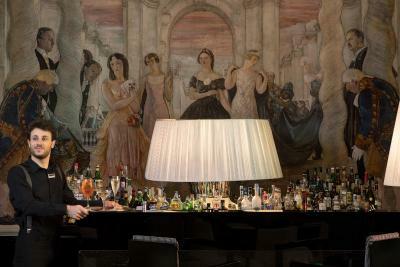 Grand Hotel Palace Rome accepts these cards and reserves the right to temporarily hold an amount prior to arrival. Everything is good with hotel. Although the room was clean it was too dark and there was a strong odour of damp every time we entered. The property was a little far removed from the night life so we ended up spending more on taxis than planned. The staff were very attentive and very interested in our trip. The room was bigger than expected and very comfortable. Room size compared to the price. Bad view. Breakfast buffet is disappointing not much of varieties No one provided coffee or tea. EXCELSIOR Hotel breakfast is better with variety and more care taken by staff. The room heating was not working properly and not everything essential is provided in the room example cutlery, kettle for coffee or tea or Iron board. overall service is average and the mini bar is too expensive. For example, it has a small bottle of juice for 11 Euro. Also when I arrived late at night, the downstairs door was shut, I tried to open the door, however the woman receptionist opened the door and said oh I thought you will never arrive. We also ordered some room service that night, lasagne arrived cold. They also forgot one set of cutlery. Wouldn’t say it is a five star service. Clean hotel at a good location. Rooms are clean and coformatable. The bathroom was cold and shower uncomfortable. Breakfast was disappointing. The location is good, staff is helpful.